Sorry for my lateness ... just very unorganized today! My little nephews gave me these ... they know I love yellow and cats ;) Sweet! 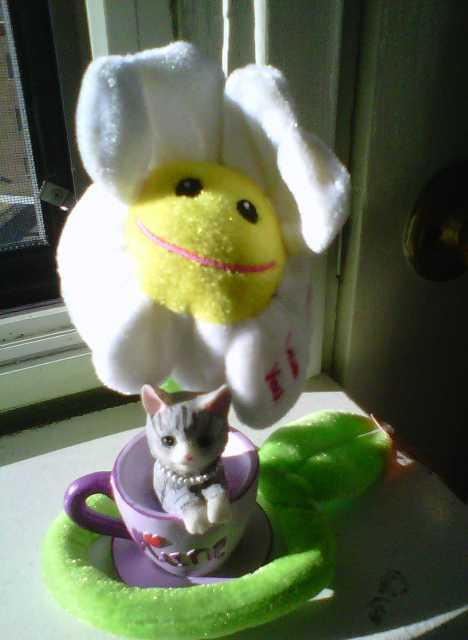 The flower says "I love you" and the cat is in a cup that says "Auntie". Thanks, see you next week. very strong and loving message. I almost thought the cat was real! Cute! wished to have a nephew so sweet. How adorable from your nephews, I love the little cup ! I love being an aunt, and a great-aunt. Your little gifts from your nephews are so sweet. It's bedtime in Alberta, so I'll see everyone else's tomorrow. SOO CUTE, wanted t0 have a kitten but too difficult to take care. first time to join, thanks a lot. So cuddly, the stuff and the cat! here with my entry. cheers! Isn't it great being an aunt? Nieces and nephews rock big time. I hope your day is lovely with all things mellow & yellow DM! Good morning! My first time linking up with you. Lots of new folks to meet-looks like fun. Thanks for hosting. blessings on your day! Yes it is cute indeed! Awh! What sweet little nephews! That is just too cute! So sweet! Love the kitten in the cup. Your nephews are very sweet. Ps: I made a mistake when entering my link and there are two now:-( could you please delete the first one? this blog of mine is joining for the first time! love yellow too! Yellow is one of my favorite color too!